It was a good week for the Relay for Life team Passionate Redheads. The night of Thursday July 7th had a special event in Southern Colorado. In the Enchanted Forest, there was a live music concert featuring two musicians. One was MoShang Zhao, the other was the self-described “best ambient artist in Second Life” Cypress Rosewood. Come to the beautiful Southern Colorado sim and the Enchanted Forest for a mesmerizing concert with Second Life artists MoShang Zhao and Cypress Rosewood as they present a two hour concert called "An Enchanted Evening with MoShang and Cypress" on July 7th, 2011 from 8-10 PM SLT. Don't miss this event, it promises to be spectacular! Sponsored by the Passionate Redheads, all proceeds from the show go to benefit the American Cancer Society through the Relay for Life. And as 8 PM approached, people began showing up at the entrance of the forest. 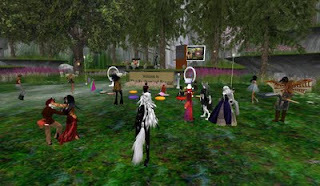 Some of the Redheads teleported directly over from a favorite club of theirs, Club Zero, which had an event just before the “Enchanted Evening.” A few dozen people in a variety of avatars came to listen in. Cypress played first, followed by MoShang doing his solo on his flute. Then the two went on stage together to play. People sat down on cushions rezzed for the event to listen, or danced to the music. Two kiosks were set up to collect funds for RFL. Several thousand Lindens were raised. It wasn’t as much as some earlier fundraisers the Redheads have held, but the event was still considered a success. At 10 PM SL time, the event came to a close, the musicians giving their thanks to all, "Thank you so much. See you next time, thanks, and good night." For more of Cypress Rosewood’s music, he makes regular appearances at the Space Music Theater at Spinthrift (156, 81, 98) at Sundays at 8 PM SL time. On Friday, the Passionate Redheads received a special gift from an old friend. With the Relay for Life Walk about a week away, builders for the team were setting up their exhibit, or “campsite” as they called it, with a "Forest in the Spring Theme." Previous exhibits have had help from friends. Among them, Lilith Heart, the owner of the Heart Garden store. On Thursday, Sabine McGettigan got a message from her. Her “some” boxes totaled over two dozen! They were rezzed at the campsite temporarily. In group chat, there were cheers and praises, “WOOOT!! !” “She's always good to us! :) ” “It's kind and great that a designer has done that.” Daaneth Kivioq got yours truly a group tag to get over to the campsite to see the goods for myself. It wasn’t long before builders Dusk Griswold and Lomgren Smalls showed up, and they and Daan began unpacking the boxes and setting things up. They were joined by other builders, including Shockwave Yareach. With all the “Bid me Human” events the Passionate Redheads have pulled, a few of their furrier teammates have asked, “So who’s having a ‘Bid me Furry?’“Almost lost in the excitement of SL8B, a couple weeks ago on June 25th, the “Cure Chasers” RFL team, noted for their cheerleader uniforms, held just that. Yes once in a lifetime because she will never do it again. “Turn Sienna Thor Into A Furry For RFL.” Sienna has been been locked in a back room at the Red River Saloon since Thursday so she could not get away. She will turn her beautiful body FURRY for $L10,000 for the first week and $L1,000 for every additional day after that. The event went on for several hours, with DJs Stormie Windlow, April McCoy, and Jocelyn Sands providing the music. Yours truly dropped in about halfway when about $15,000 was raised. Sienna was there dancing away as a racoongirl. She remarked of one of the greetings she had gotten from a furry passing by, “Hello cutie,” was that it had been months since anyone had ever greeted her like that. For whatever reason, the stakes were soon changed. After $20,000, she would take on the form of a “tiny” raccoon. It wasn’t long before that was raised, and she shrunk in size to kneecap height. Fortunately for her, there was a “tiny” danceball for her and the other tiny present to dance around in. There was also a kissing both there for additional fundraising. Also that day, singer Lance Rembrant was giving a two-sim concert to raise funds for Relay for Life. So much was happening that day, there just wasn't time to write about it all. With about a week to go until The Walk, the various teams are pulling numerous events. One I noticed was a “biker babe” Road Rash rally being held this Friday, Saturday, and Sunday. There’s no shortage of events, so be on the lookout for one if you’re inworld, and stop by.